mobilized activists from across New York State to rally against mass incarceration and to advocate for parole reform in meetings with legislators. joins a “Cuomoville” encampment at the governor’s Manhattan office to protest high rents and demand state support for housing justice. leads the call for immigrant justice, providing undocumented youth tools and space to organize in their communities and to agitate for structural change. coordinated the “School of Assassins” weekend of protests, demanding the closure of the U.S. training camp notorious for instructing Latin American soldiers in the use of torture and execution. calls for the closing of the Indian Point nuclear power plant as they travel the Hudson River in a campaign for a just peace and a sustainable, shared future. The Muste Institute provides grants, sponsorships, and educational resources to hundreds of grassroots projects around the world. We fund innovative organizing, often with seed funds that give a necessary boost to bold ideas. We also provide affordable and collaborative space to a dozen or so groups in New York City. In the words of our grantee, 350 Seattle: To change everything we need everyone. For those of us who have never attended a rally, joined a picket line, or called for social change, this is the time to get involved – pick something and fight for it. For those who have committed our lives to radical resistance, it has been a time to fight harder, to extend our reach. From our collaborative office and meeting spaces to our far-reaching grantmaking programs, the Institute supports and sustains individuals and organizations fighting together for a just future. The A.J. 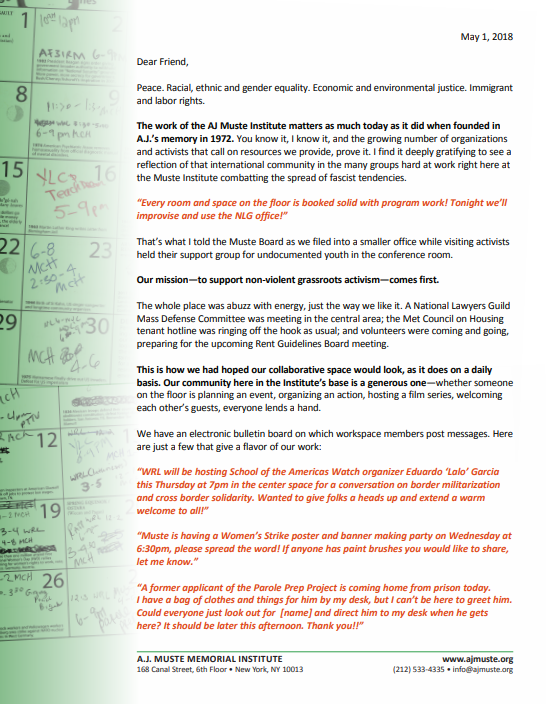 Muste Memorial Institute was established by members of the War Resisters League to offer safe space to radical organizations threatened by government surveillance and harassment. From its start at a borrowed desk run by volunteers in lower Manhattan, the Institute gained tax-exempt status in 1974 and began raising money to help grassroots projects through grants and fiscal sponsorships. Both a shelter and a hub, the Institute has grown into a non-profit charitable foundation for innovative organizing across the nation and the globe. If you are an organization in need of support, or a donor able to help us provide it, we welcome you to our community of undaunted activists. Muste was a central (yet largely unknown) figure who introduced a young college student and seminarian named Martin Luther King, Jr. to the notion of nonviolent activism and, by doing so, changed him and, through him, the entire country. When Muste first presented his views to King, the two men fell into a “pretty heated argument,” before King could agree. A.J., not Gandhi, was the first to influence King in his turn toward nonviolence. Muste was a deep and tough thinker. He believed that when disparate groups learned to work together they could influence social change. He was a tireless organizer who built coalitions and could bring those groups together like no other. This has been reflected in the A.J. Muste Institute's support for the underpinnings of diverse grassroots campaigns – not just to end the death penalty, but to oppose militarism, defend the environment, confront racism, and build social justice. For Muste, and for the Muste Institute, activism from the ground up is the fundamental key to organizing movements that can make social change into a reality. Political dissent is never easy – it wasn't in the 1940's when Muste was debating with Martin Luther King; nor is it easy now.